I’ve been thinking about purchasing Helicon Focus Pro license. But before I do, I wanted to ask the group 1. 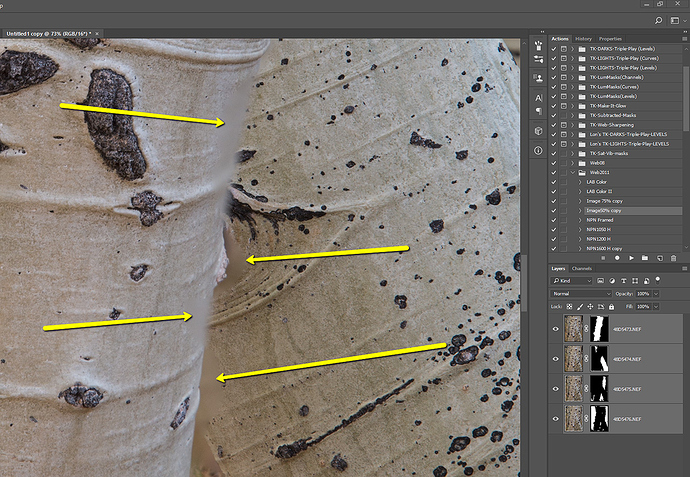 What are the alternatives to PhotoShop when it comes to focus stacking? and 2. If Helicon is the best alternative, what has been your experience? My experience is limited, but I like the concept of stacking for maximum detail throughout. Obviously there are times when this is advantageous, other times when not appropriate. but I like to have the option. I’ve had success and happy with most of my results in PS, but there are limitations and flaws. Any thoughts or recommendations much appreciated. The other major option is Zerene Stacker, Lon. I have both, but mr copy of Helicon is a bit dated and I believe its capabilities were significantly improved recently. Zerene used to be easier to work with for removing stacking artifacts, but I think that might have changed. @Phil_Hodgkins is very conversant with both, so be sure to get his input. I use Helicon. Based on stacking in Photoshop vs. Helicon, it’s no contest. Helicon is MUCH faster and far more accurate. I tried Zerene but just didn’t like the flow. Guess it didn’t match my thought processes. Most of my stacking has been in the macro world, but a few landscapes as well with really close foreground objects. No issues. I’m not a big focus stacker, but I can at least say the automated photoshop function is worse than doing it by hand with masks, and Helicon is really nice but kind of expensive if you don’t use it much. That’s all I’ve ever tried. I’ve been using Helicon for many years and have been very happy. I can’t compare it to the current version of any other software, so I couldn’t say which is “best”. When there are multiple good choices, a trial version comparison is usually the best option. Thanks for the responses folks. Duh, on downloading and checking out trial versions… The Helicon sw is fully functional for 30 days, so I’ll be giving that a try. Then again, they have a holiday sale $40 off regular price, so I may just purchase anyway. My initial fear like with anything new or different is being able to use the software without much pain and minimal learning curve. It seems to me these focus stacking programs are great for very complicated subjects (macro/micros of flies and table-top photography…) I have no plans for anything like that and would utilize primarily for simply landscape type images (you know me, grasses, etc.) Nothing complicated about the PS process - it’s just that it doesn’t deliver great results, depending on the scene. The most I’ve ever stacked is 9 images. Most of the time it’s 5 or less. I’m just hoping there’s an “easy button” for simple stacks. Sure, I get the power of the sw, but if I don’t need all the bells and whistles, I hope it’s easy enough to produce a quality image without too much trouble. I’ll probably download the Helicon sw. Was just checking to see if there were any other options out there that I hadn’t heard about. Thanks for the Zerene Stacker reference too. I’ll post back on what I end up with. Probably Helicon. What issues are you seeing when using Photoshop to do the stacking? Just curious to know, that’s all. Hi @Anil_Rao, thanks for asking. Now to be fair to PS, I’ll be the first to admit that I’m not a genius when it comes to the technical aspects, and I try to take the simple, easy route. There’s operator error too, and I’m not even sure I’m doing the best job in the field when capturing, which could make it harder for PS to do stuff. 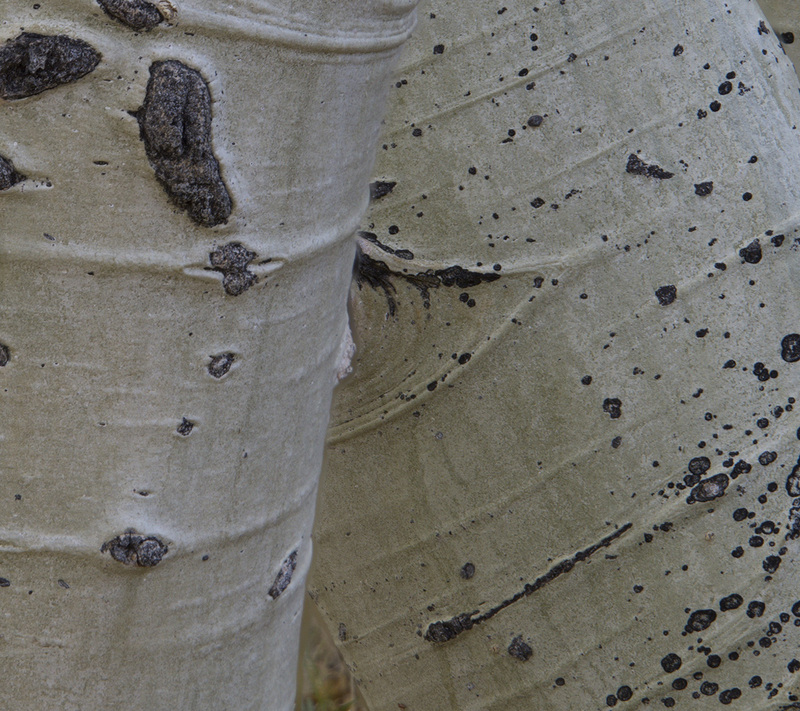 Here is a close up example of a simple 4-image stack. It’s a grouping of aspen trunks separated by maybe 15-20ft front to back. I’m zoomed out at 170mm and shooting at f/8. There’s a visible difference in focus between front and back trunks, plus 2 other focus points in between. Anyway, PS often can’t figure out which area is best, or the in-focus areas are “too close” for PS to distinguish, and it attempts to do some content aware filling, or other things I don’t understand. The end result are areas that are not well defined and clearly not fit for printing or often even web display. This particular intimate scene worked better at f/16 than the attempt at stacking. A little hard to tell in this image, but hopefully you can see. Keep in mind too, this image contains only aspen trunks - no moving in the wind and not many fine details or difficult edge transitions. Imagine what the difficulty is in hundreds, thousands of tiny leaves. In most of the grass images I do, the details are so small that the imperfections in the stacks are not even close to being visible in a 1500px web view. Anyway, thanks for asking. And again, it’s highly likely that I lack some process flow to improve what PS can do. If you google “Michael Frye focus stacking” you can read his article, which is good and straight forward. He recommends using Helicon on the default settings for Method B. I’ve followed his advice with good results. That’s the same kind of results I get with photoshop. It’s also really hard to fix a blend like that too with the complicated masks it makes. I had been considering Helicon and a rail for the project I am working on now, but amazing as his demo was, it proved I didn’t need either rail or program. But the capabilities are gnawing at the back of my brain! Thanks @Tony_Siciliano! I’ll definitely check it out. Thanks @Brent_Clark. I took a bit to become familiar with the basics, but not too bad. Since 2009 I have been taking workshops with a pioneer of focus stacking. The technology and workflow has widened over the years. Nikon recently released the mirrorless Z7 which expanded their automated focus stacking technology. 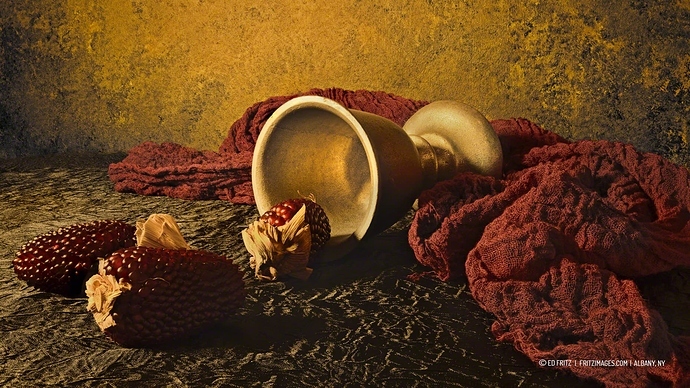 It is common now to make a still life scene with multiple 16-bit 45-Megpixel images at f4 (for bokeh) and then f8 (depth of field) of 300 image stacks in RAW then convert to TIFF then compile with Helicon Focus then use the 2 complied images to blend/create your final image in CC19. This requires a high end GPU and CPU processing power. Helicon Focus 7.0 takes advantage of scaling to 10 CPU cores. Does Helicon Focus work better that CC 2019 ? For small stacks no. It’s not worth the extra workflow steps. However for complex stack >5 images, consider Helicon Focus. Future proof your image making and learn new skills. I have found this software intuitive and adaptable to various type of photography. The manufacture is also active at issuing new releases. The image below, ‘Yuletide Chalice’, is a composite of 2 stacks of 31 images made with the Nikon Z7, compiled with Helicon Focus then created in Photoshop 2019. In the past, you would have to spend more time and effort on the technology of creating the image stack and compiling. Today, with the auto focus-stacking capable cameras and Helicon focus doing the technology heavy lifting, your energy can be channeled into the creative process. @Ed_Fritz, thanks for chiming in. That is one gorgeous image and it’s pretty obvious to me the value in the technology for this type of photography. So for @Harley_Goldman question, I went ahead and bought the sw. Holiday sale right now at $160. I’ve processed about a half dozen and can already see the benefits. The biggest one: Stacking in PS - it is what it is, you get what you get. With Helicon you have options; you can render with different methods and then tweak settings within each. Find what works best for the particular image you’re rendering. I’m sold. Thanks all for your comments and discussion. I’ve been playing with helicon a lot the past couple weeks and am very impressed, especially with the dng workflow, it’s way cool to end up with a raw file. I also spent a lot of time with Zerene a couple of years back and it did the best job on some moving wildflowers, but I think I like the way Helicon works better now, so I’ll be making the switch and using the discount myself. David, thanks for the tip on the DNG file, I’ve owned Helicon for 2 years now, and never knew that you could export raws and return a DNG file. For some reason when I set up Helicon, I had it return TIFF files, but returning a DNG has a lot of benefits. Otherwise I’ve used Helicon for both landscape and macro focus stacking, and am very happy with it. Helicon often does a better job than using Photoshop, and it has a much faster workflow too.